Need a nifty way to hold that gift card? 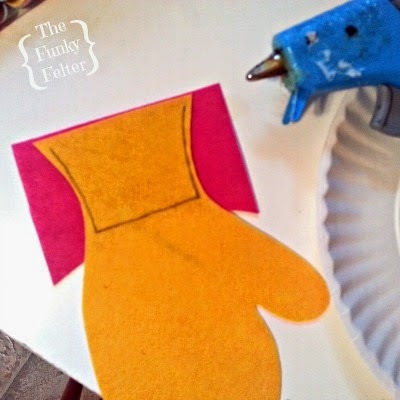 Make a cute felt elf stocking or mitten ornament for it! There's always a last minute gift to give, and a gift card is such a great solution for that. Am I right?! 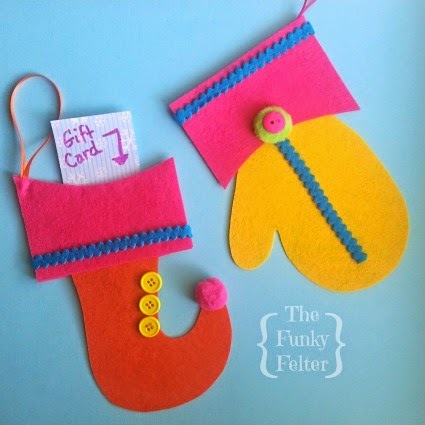 Well, here's a dandy little felt gift card holder and ornament in one. It also works well for small treats for the kiddos. See below for links to the free printable patterns and full craft tutorial. CLICK HERE for the free printable elf stocking pattern. CLICK HERE for the free printable mitten pattern. 1. 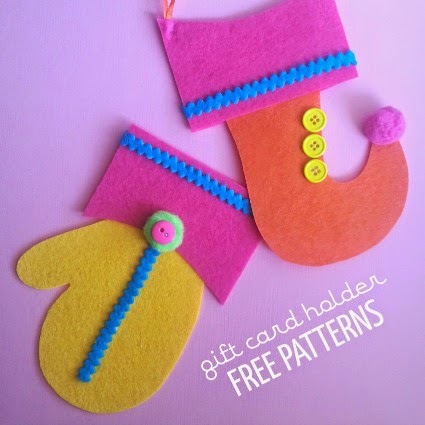 Print and cut out my free felt patterns from the above links. (Be sure to print the patterns full size so they are large enough to hold a gift card.) Follow directions on the printable to trace and cut out all the pieces from your choice of stiffened felt colors. 2. Hot glue only the front cuff onto each of the corresponding elf stocking and mitten. Use the photo above as a guide for placement. 3. For the back cuff, hot glue only around the edges of where the cuff will be placed. This leaves an open pouch for inserting the gift card or small treats. See the drawn lines on the photo below for an example of where to place the glue. I recommend using a pencil to draw some glue guide lines of your own. Also, it is a good idea to lay your gift card within the penciled outline to make sure it will fit and adjust accordingly if needed before gluing the cuff to the mitten or elf stocking back. 4. Now cut about an 8 inch length of ribbon, knot the ends and hot glue at the corner for a hanging loop as seen in the photo below. Then add embellishments as you like. I used some rickrack, pom poms and bright buttons. Insert your gift card and hang it on your tree or pass it along to a lucky friends.